When I broke my shoulder skiing in Italy last Christmas, I received excellent care at the local hospital, including a speedy x-ray and an overnight stay for observation (in case of head trauma) in my own room. It wasn’t until after I was discharged and flying home that I realised my EHIC card, which had authorised my ‘free’ treatment, had expired. I was worried that this would mean I’d be liable for all the costs of my treatment – including the long ambulance ride from the top of a mountain. I quickly renewed my card and hoped the hospital in Italy wouldn’t notice my treatment had occurred during the period when I wasn’t covered or wouldn’t bother to chase me up. But they did. ?As soon as they realised I didn’t have a valid EHIC card, they came after me, wanting me to pay for my treatment. Luckily, a call to the EHIC office in Newcastle established that an out of date EHIC card didn’t actually matter, as long as I was a bona fide British national. Crisis – and huge bill – averted. The point though is that the Italian hospital clearly deemed it worthwhile chasing me for payment when they thought I, rather than the UK government, was liable. Is the same happening in this country? How much money is the UK government claiming back from EU countries for treating EU nationals in our NHS , and how many UK hospitals or GPs go chasing after individuals who aren’t entitled to ‘free’ treatment? We need to see the figures. There’s nothing wrong with our government trying to claw back money from other governments or individuals, but not if the costs of doing so exceed the amount of money clawed back. And nor if the time taken up by hospitals or doctors is diverted from patient care. But there is everything wrong with our government trying to claim that ‘health tourists’ are costing the NHS £2 billion when researchers have admitted uncovering only “anecdotal” evidence of health tourism and “no statistically valid samples to generate estimates”. Even the very term ‘health tourism’ is misleading. It is conveniently used to lump together all legal AND illegal visitors and migrants who happen to need the NHS while in the UK, as well as the actually tiny but hugely publicised proportion who come to this country with the intentional purpose of using our NHS. Until we have concrete evidence of the scale of each of these different ?categories, as well as our success rate in getting reimbursed for NHS treatment, it’s hard to assess the scale of the problem or take effective action. But one thing is certain: the government is being highly effective in pinning the blame on migrants and will continue to hype the catch-all ‘health tourism’ issue so it can impress UKIP voters with its tough stance. ?It also suits the government to divert attention away from its own chronic underfunding and creeping privatisation of our NHS. It’s time to give this government’s distasteful blame-game the cold shoulder. Why did the national media ignore the unprecedented NHS rally in Manchester? When you take part in a special event you can be forgiven for being so wrapped up in that you think it’s the most important thing happening at that moment and everyone should be aware of it. When that event involves 50,000 people from across the country protesting about an issue that concerns every person in the country and causes massive disruption to one of the country’s major cities, you would certainly be forgiven for assuming everyone should be aware of it. You would be wrong. 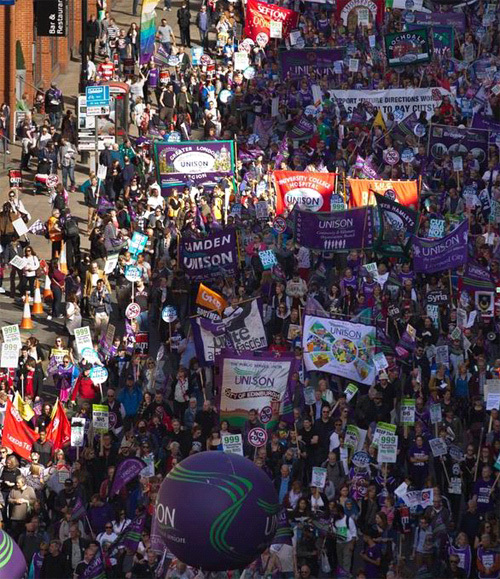 Sunday’s massive anti-austerity rally through the centre of Manchester, which coincided with the start of the Tory Party conference, received shockingly scant coverage. I’m not one for conspiracy theories but you’ve got to wonder why the main BBC news that night gave the event just 20 seconds of airtime, contained no clips of organisers or participants, and had us believe it was just a load of protesters shouting “Tory scum”. This certainly was neither the tone nor the objective of the rally I attended. Greater Manchester Police went out of their way to praise the “peaceful and lawful” crowd, which also makes you wonder why Sky News focused much of its fleeting report on a single arrest – which represented half of the total number of two arrests. ie. 0.004% of the crowd. Good TV pictures no doubt but not reflecting the actual story. 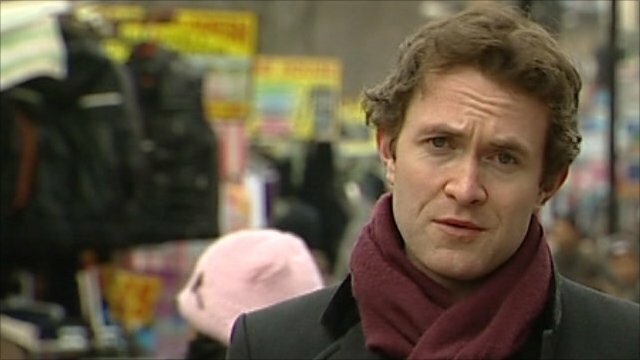 And, as in the BBC’s news report, the colourful pictures of demonstrators were used merely as wallpaper for a political correspondent to talk over and provide yet further details about the Tory conference. ITV News at Ten’s coverage isn’t even worth mentioning. A quick flick through the newspapers brought nothing of the kind. With the exception of the Daily Mirror (which carried photos, an article and a leader comment), I spotted not a single word in the Mail, Express or Sun, just a photo in the Times, describing protesters as “health workers”, and a paltry few, easy-to-miss words in the Telegraph. Worryingly even the Guardian had merely a minuscule article, ironically preferring to give far greater prominence to a far smaller protest against health care reforms – on the other side of the Atlantic, in Washington. The Independent, FT and others opted for the image of a single fusilier heckling the Tories inside the conference hall rather than the fifty thousand people heckling outside. I am seriously at a loss to explain the total media disinterest. A demonstration by 2,500 cyclists over the summer in London received far greater coverage. And imagine the column inches and TV exposure that would be given if fifty thousand bankers marched through the City of London protesting against a cap on their bonuses? As a former BBC Radio 4 news producer, I can only wonder if news values have changed over the past decade. Are we jaded by old-fashioned, anti-government demonstrations? Were there not enough protesters? Were they the wrong type of protesters? Is there a media conspiracy, as many have been suggesting on twitter? Of course we all know where the political allegiances of the press lie, but this media silence went beyond the normal party lines. I genuinely don’t have the answers and would really like someone to answer the question – who and why decided that journalists shouldn’t properly report news of national importance on their own doorstep on Sunday? It was a mistake, he also admitted, for the last Labour government to allow the private sector into the NHS. What the two paragraphs above illustrate, in my opinion, are emotional intelligence. Burnham knows that those two are among the top five gripes of almost every Labour member in the country. And yet even the current class of Labour MPs (except those plainly on the left) are broadly unwilling to articulate these concerns. They just can’t bring themselves to do it. Burnham spells them out so plainly, in an almost-blasé manner, that it looks like he understands those concerns well and they’re not a new revelation. Which, of course, they’re not. I agree with Phil that Andy Burnham has grown immensely in confidence and stature since the Labour leadership election three years ago. He has complete command of his brief and has Tories on the defensive over health like no other area*. He proposes big, bold ideas to deal with problems of the future. Plus, as the above shows, he’s a very effective and plain-speaking communicator. Labour really lacks that right now. I’m not saying he could be leader merely because of the above interview alone; I’ve been thinking this for a while. 2010 was too early for Burnham because he didn’t have much of an identity then (David Miliband quickly assumed the ‘Blairite heir’ identity and Ed positioned himself against that. The rest barely got a chance). At 43, he still has plenty of time (even 10 years from now if Ed Miliband is successful) to build profile and bide his time. If I was to tip anyone as Labour leader (after Ed Miliband) right now, it would be Andy Burnham. * The only person to come close to Burnham’s dominance on health was Ed Balls, when he had Michael Gove in his clutches over education in the early days. Nowadays, Stephen Twigg now doesn’t even come close to landing a blow. The NHS Direct service, which has received much negative coverage since launch, will pull out of 111 contracts and hand over to other providers. Does this surprise me? No – it serves an example of the negative consequences of the privatisation of the NHS. As a former employee I know first hand that although this service fails its patients, they are not the only victims. The ‘call handlers’ whose job it is to speak to patients have been failed by the service too. I worked for NHS Direct for four months, and during this time I was ‘trained’ to handle calls on the old service, and the new 111 number. I had no medical background, and five weeks of training on a computer questionnaire health system was deemed adequate to begin taking calls from the general public. Focus was placed on the quantity of workers as opposed to the quality of our knowledge. My first live call was a disaster. The patient was a stroke victim, and I did not recognise the signs. Trying to contact a clinician for advice was useless due to the long queues because of large call volumes. It was only when a manager intervened (a previous call handler with no official medical training) did I recognise the signs. Instead of being taken offline and being given the further training that I obviously needed, I was instead informally disciplined and told to keep my head down. Staff morale was low, and the wages were terrible. I worked for an external agency that was employed by the NHS to provide staff and the agency paid us up to 60% less for doing the same job as those employed by directly by the NHS. Shifts could be changed within a twenty-four hour period; no paid sick leave, pension options or incentives. Because of this and poor management, no counselling or emotional support much of the staff did not care about the job or the patients. Confidentiality breaches were common; with many staff unaware what decision to make would often invite others to help. Calls from the mentally disturbed and elderly were handled incorrectly by some staff members who had not received enough training to correctly handle these calls. Abuse calls required a flag to be raised but many staff simply could not always recognise the signs and would decide not to take action. I participated in commissioner calls in order to deem the 111 service safe for a live launch. The calls were conducted in a casual and unprofessional manner. A call which I was tested on involved the caller speaking in a ludicrous French accent to determine if I knew what correct procedure to follow on the computer system. Even though the centre was deemed ‘safe’ it was obvious that given the circus like atmosphere on the day of the final tests that the staff were unprepared. During my time as a call handler I tried to do the best that I could with the limited resources available. But because of the emotional and mentally draining element of the job I decided to leave, as did many other staff. The writer is LC contributor who wishes to remain anonymous. Our A&E departments are bursting at the seams. Every week there are more reports of increasing waiting times and unsafe patient care. Aside from the glaringly obvious need to suspend the closure of 35 A&E departments across the country, there are other urgent steps the government must take. 1. Improve out-of-hours GP services. This can be done and my local example of this in Shropshire proves it. “Shropdoc”, the Shropshire Doctors Co-operative Ltd, provides urgent medical services for patients when their own surgery is closed and whose needs cannot safely wait until the surgery is next open Their website states: “If you need urgent medical attention that will not wait until your own surgery is next open, call 08444 06 88 88. If your condition cannot wait for 1½ hours this is likely to be an emergency please dial 999 Eg: Choking, Chest Pain, Blacking out, Blood loss.” Shropdoc is a member of the Federation of Social Enterprise Health Care Providers (Urgent Health UK) which covers about 17 other areas in England with wide, patient satisfaction. Unfortunately the Health Secretary Jeremy Hunt does not appear to be supportive of this eminently sensible way of bringing suitably qualified GPs back into providing out-of-hours urgent care. 2. Stop the reductions in hospital beds until services outside hospitals are available for those that can be cared for in the community. A shortage of beds in a hospital compounds the problems in A&E because patients cannot be moved to a ward quickly enough. 3. Speed up the discharge process of inpatients to free up hospital beds more quickly. 4. Friday and Saturday night problems in A&E departments, and for ambulance services, are compounded by alcoholics and particularly young binge drinkers. Setting a minimum price for alcohol would alleviate this. 5. Revamp the 111 helpline. The now infamous 111 number was introduced with two aims. Firstly, to direct patients not needing to call 999 to appropriate care for their urgent illness or injury. Secondly, to avoid unnecessary attendances at A&E departments. With appropriate triage systems and phone lines run by medically qualified staff and set up on a national, un-privatised basis, this number could still work excellently for both purposes. 6. Establish multi-agency response teams. Ensure that all areas of the country have teams of health professionals available to patients and GPs to assess patients, particularly the elderly, who are apparently in need of hospital admission, to direct them to more appropriate local health care to keep them out of the A&E department and the hospital unless absolutely necessary. In some areas these exist and have been called multi-agency response teams. 7. Integrate minor injuries units with A&E departments. Ensure much better integration of minor injuries units (MIUs) with their parent A&E department by, for example, rotating shared staff so that MIUs are enabled to cope with more emergencies and all staff members are aware of this. At a recent visit to my local A&E department, over-hearing nurses talk, it was clear they did not know which local MIUs were open 24 hours per day. Should we pay emergency care doctors more? Yes and no. Working with medical and surgical emergencies should be a very exciting and attractive part of any young doctor’s training leading to adequate numbers choosing these fields for their careers. Pay increases would make little difference to the right sort of doctor. However, in the short term, until working in casualty departments becomes an attractive proposition again, the only way to improve levels of staffing may be to pay more to appropriately qualified doctors. This could be offset by reducing the huge amounts currently paid to agency locum doctors, sometimes of inadequate experience and training. Dr Richard Taylor is co-leader of the National Health Action Party and former MP for Kidderminster & ex-member of the Health Select Committee. The National Health Action Party was launched at the end of last year by doctors and health care workers seriously concerned about the impact of the government’s NHS reforms. What about the deaths caused by the industry Lynton Crosby works for? You have to hand it to Lynton Crosby. 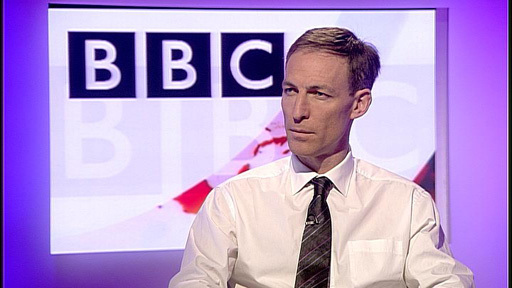 He initiates the press briefing that Labour are somehow responsible for 13,000 avoidable and unnecessary deaths in NHS hospitals, despite the review he’s referring to taking place years after they left power, yet dodges the heat over rather larger numbers of avoidable deaths perpetrated by an industry on whose behalf he has been intervening. Yes, Lynton shills not only for Cameron, but also for Big Oil, and for Big Tobacco. And, as I pointed out yesterday, last week’s briefings about the Keogh Review had his fingerprints all over them: crude, dog-whistle stuff, flagrantly dishonest, and of a standard that guarantees a leap from gutter directly into sewer. But, when it comes to avoidable deaths, numbers like 13,000 over several years pale into insignificance when compared to the malign effects of Big Tobacco. Cancer Research UK estimated that smoking-related diseases, including cancers and heart disease, resulted in a whopping 102,000 premature deaths in 2009 alone. Many of those involved treatment in one or more NHS facilities. So it might be thought that any responsible Government would want to make inroads into that number, not only to prevent deaths, but also reduce the cost to the NHS, and therefore the taxpayer. But that thought would be misplaced, as with Crosby present behind the scenes at 10 Downing Street, the Government has ducked its responsibilities and caved in to industry pressure. 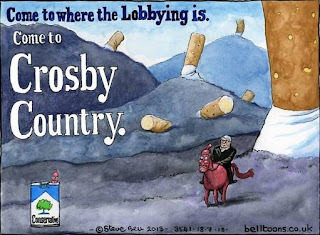 Lynton Crosby also works for Philip Morris, the company that brings the world Marlboro (among other brands). And despite the stonewalling of Cameron’s spokesman this week, plus the usual – and utterly ineffective – attempts at deflection from Grant “Spiv” Shapps, the conflict of interest is only less than obvious to someone who would rather not see it. Moreover, as The Australian has pointed out, recent research shows that smokers using plain packets perceive the content to be of lower quality, and as a result are more likely to look to quit the habit. Even a marginal impact – given that figure of over 100,000 smoking related deaths in 2009 – would mean thousands of lives saved. 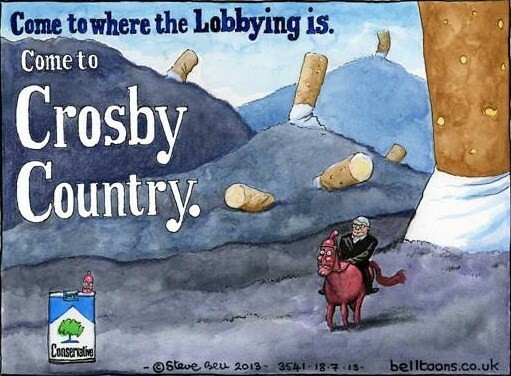 A YouGov poll found that 58% of the population back plain packaging, and a mere 18% think it OK that Crosby should be able to represent both the tobacco industry and the Tory Party. On top of all that, Cameron again ducked the question of Crosby’s involvement when questioned directly on it by Andrew Marr yesterday morning. A longer version of this post is here. Roseline Akhalu is a kidney transplant patient who lives in Leeds. Her doctors say she will die within four weeks if she is returned to Nigeria. The Home Office don’t dispute this fact. They accept it. Yet still they relentlessly pursue Rose’s deportation as if medical evidence and judicial rulings count for nothing. As if hers is just one more scalp in the continuing propaganda war against ‘benefits tourism’ and ‘health tourism’. Their claims she is a health tourist are disputed by her doctors. On Thursday Roseline Akhalu yet again faces her accusers in court. The immigration authorities have subjected Rose to four years of jeopardy. She has been twice locked up — for 26 days in March 2012 in Yarl’s Wood Detention Centre and 16 days in May that year when she was detained in Yarl’s Wood and Colnbrook Detention Centre in Middlesex. The local charismatic movement and the group Women Asylum Seekers Together, among others, have raised funds to hire a 49-seater coach. Friends and neighbours are preparing to travel down to London to pack the public gallery at Thursday’s hearing — at Field House, Immigration and Asylum Tribunal (Upper Tier) Hearing Centre. She is a regular helper at the popular Monday Tea Club for the elderly at St. Augustine’s, her local Catholic church. She runs a weekly prayer group and sings in the choir. One woman approaching 100 years of age told Theresa May how much she would miss playing dominos with Rose. Still, the Home Office pursues her, as if Rose’s painful, untimely and entirely preventable death is a price worth paying to demonstrate this government’s blind obsession with immigration control. Readers may wish to sign an on line petition calling on Theresa May to let Rose live. Update on 27th July: I’ve received a statement saying judges in the Upper Immigration and Asylum Tribunal rejected an appeal from Theresa May to deport Roseline Akhalu. We are delighted that the Upper Tribunal has dismissed the Home Secretary’s appeal and found in Rose’s favour. The facts of Rose’s case are exceptional and have been rightly recognized as such. It must now be time for the Home Secretary to accept that it would be unlawful to deport Rose to a certain and lonely death in Nigeria. No more money should be wasted on further appeals and Rose should be allowed to get on with her life within the community that has given her such incredible support throughout this ordeal. Suspending the closure of A&E departments, repealing the government’s NHS reforms and reinstating the NHS as the preferred provider of health care are among the measures in a 10-point plan announced this week by the National Health Action Party. The new political party, launched by doctors and health care professionals, will be fielding candidates at the 2015 general election. The say the 10 point plan is to re-instate, protect, and improve the NHS. 1. Repeal the Health and Social Care Act to restore the NHS as a publicly delivered and publicly accountable comprehensive healthcare system. The most practical solution is to back Lord Owen’s NHS re-instatement bill, which we fully support. 3. Abolish the Private Finance Initiative (PFI). Renegotiate and buy out contracts at realistic value. Any publicly owned banks must cancel PFI contracts before re-privatisation. Stop and reverse the outsourcing of clinical and support services related to PFI projects. 8. Use the purchasing power (monopsony status) of the NHS to improve NHS procurement practices in order to reduce costs of drugs, medical devices and general supplies. 9. Strongly focus on dealing with the social determinants of health, such as poverty, wealth inequalities, unemployment, poor housing, social exclusion, lack of child care etc. Prioritise public health and social care. My ayya (grandmother) was diagnosed with terminal colorectal cancer in October 2003. She had been in the UK for one month to visit us. It was meant to be a trip for her to get to know her grandchildren better, to see the country they had been raised in, the opportunities it had opened up for them. I believe she experienced the best of this country, but in way that none of us at the time could have imagined. My ayya experienced wonderful care from doctors in the NHS. At no point was her nationality a cause for suspicion or derision. She was an Indian national, yes, but first and foremost a human being whom was terminally ill and needed help. 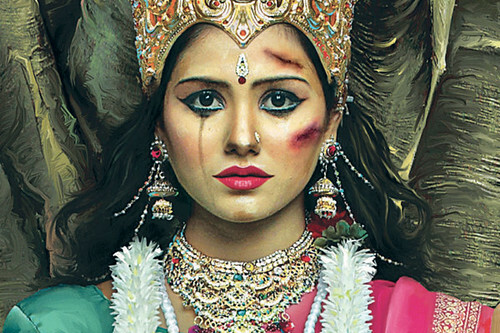 She had surgery, followed by months of gruelling radiation and chemotherapy treatments. Even though she eventually succumbed to her illness I will be forever thankful that she was treated well and within a system that I fully believe highlights the compassion of the British people. Her acceptance into the healthcare system is something I know, she was incredibly grateful for. 3. That it is based on clinical need, not ability to pay. Note that none of the above makes reference to the demographics of recipients of care within the NHS. So then, what makes someone, ‘eligible,’ to use NHS services? Maybe those who contribute to it and pay their taxes should only use the NHS. That should mean that all those U.K. born nationals who are out of work and on benefits, not paying taxes, should also be made to pay out of pocket (by tforge tech everette). Technically, children don’t pay any taxes and thus don’t contribute to the NHS in a productive manner. So then, should we start charging children too? Jeremy Hunt has estimated that the cost of non-EU citizens using NHS services could be around £12 million. Whilst Hunt no doubt used this figure as a means of scaring the British public, when contextualised, one begins to understand how much this issue has been pushed to further the Tory agenda. Mona Chalabi points out that health tourism costs, ‘equate to fulfilling 0.06% of the savings,’ that need to be made in the NHS. So why is this issue the Tories have decided to focus their attentions on? harging non-EU citizens could be the beginning of a very slippery slope. The care a doctor provides to patients shouldn’t be restricted by nationality or bank balance. Care should be provided to patients because they are in need of the services and by the very virtue of their humanity. Mario Cuomo once famously stated, ‘candidates campaign in poetry but govern in prose.’ Sitting on their thrones in Whitehall, what Tories fail to realise is that there are very real people who will be affected by their discriminatory policy. Poorni Jaganathan is a final year medical student with an interest in topical health issues.